What Is the Shure Beta 58A Microphone? 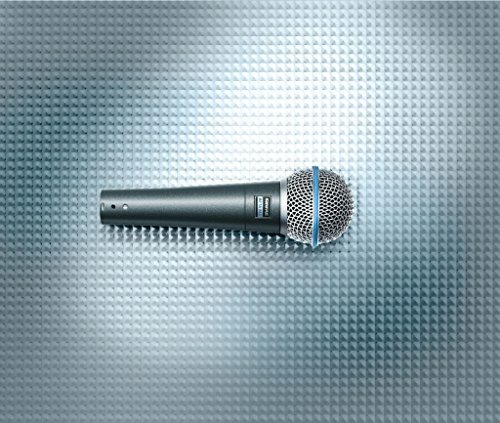 Who Is the Shure Beta 58A Mic Designed for? What’s Included with the Shure Beta 58A Mic? Conclusion – Should You Get the Shure Beta 58A? 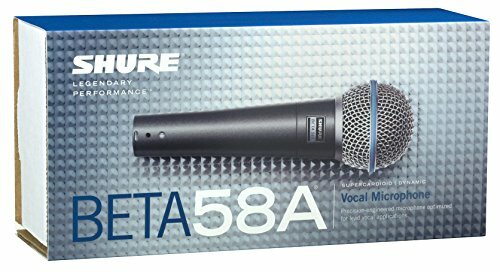 The Shure Beta 58A is a common choice for musicians seeking an affordable mic. This handheld microphone is a step up from the economically-priced models and a step below the professional microphones that Shure is mostly known for. With the Beta 58A microphone, musicians receive a high-output super-cardioid microphone with a dynamic diaphragm. Over the years, it has become a standard mic for all types of vocalists and performers. It also a popular option for those that are buying their first high-quality mic. The Beta 58A is built with a die-cast metal case and a spherical steel mesh grille. The case is reinforced and includes a matte finish with silver blue enamel paint. The standard XLR connector is used for connecting the mic to your sound system. The Shure Beta 58A is a handheld mic. However, it is compatible with slip-in microphone mounting. These features make it primarily intended for use on stage. Another feature that stands out is the weight. The Shure Beta 58A weighs just 9.92 ounces, making one of the lighter handheld microphones to deliver pristine sound. It also measures just under 6.5-inches. For over 15 years, musicians have relied on the quality of the Shure Beta 58A for their live shows. The 58A was first released in 2001 and has not undergone any major redesigns or improvements. It was a quality microphone when it was initially released and remains a popular choice. The Shure Beta 58A microphone is designed for all types of musicians and musical applications. While it has been tailored specifically for vocals, the uniform sound reproduction is also suited for instruments. While the Beta 58A is made for musical applications, it also provides the frequency response that you need for recording clear speech. Live Streamers, reporters, and podcasters may find this mic suitable for their productions. 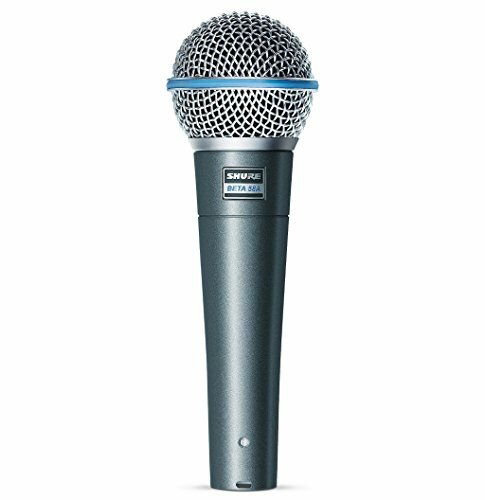 The Shure Beta 58A is also reasonably priced, making it a great entry point for anyone that needs a decent microphone. 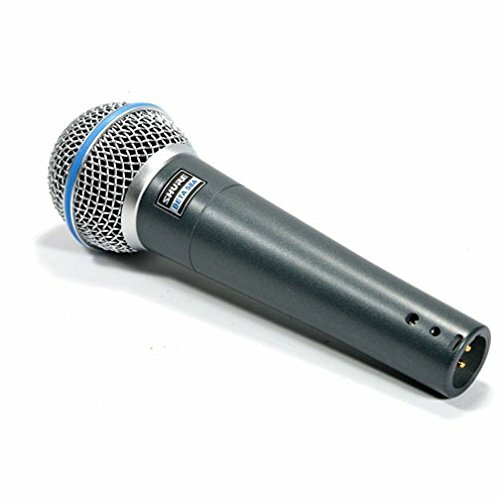 It has become one of the top microphones for all types of applications. When you open the package, you will find several items besides the microphone. 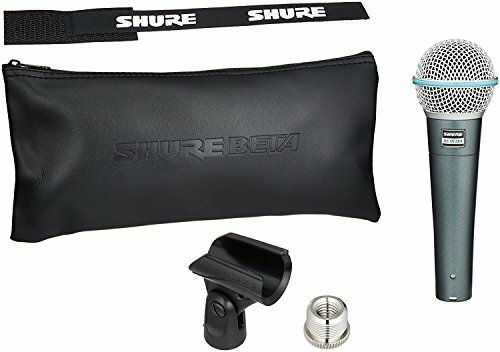 The Shure Beta 58A comes equipped with a slip-in microphone stand adapter, protective case, and microphone clip. The zippered case is made of leather and has a soft interior to protect the exterior of the microphone from scratches and electric shock. However, it will not protect against impact damage. You do not get a microphone cable or a windscreen, which are rarely included with a standard mic. You are simply getting the high-quality 58A handheld mic and a few basic accessories. The Shure Beta 58A features a uniform super-cardioid pickup pattern. The pickup pattern helps capture high-frequency sounds before feedback and reject off-axis sounds. There is less external noise and greater clarity. The vocals are further enhanced with the tailored calibration of the diaphragms. The microphone has been adjusted to suit vocals by increasing the pick-up of mid-range frequencies. The pneumatic shock mount system also aids vocal performance by minimizing breathing sounds and pops. The shock mount also shields the diaphragms, helping to reduce the risk of damage. Additional protection is provided by the hardened steel mesh grill and the metal case. Like most Shure microphones, the Shure Beta 58A has undergone rigorous testing, including getting dropped multiple times. This durable design is essential for mics that may get a lot of use, especially for live performances like church services. Another useful feature is the neodymium magnet that is included to help deliver a high signal with minimal noise. This should help reduce the need to dramatically boost the signal, which normally results in more feedback and distortion. Despite the popularity of this microphone, some people are not satisfied with the overall quality of the sound. When dealing with audio equipment, the minor variations in performance are often subjective and based on personal preferences. Overall, most people love the Beta 58A. However, several customers believe that the sound was a little tinny. There are several microphones that offer comparable results to the Shure Beta 58A. A couple of these options are also manufactured by Shure, including the Shure SM58 and the Shure KSM8. The Shure SM58 and the Shure Beta 58A have nearly identical designs, both internally and externally. Both microphones have a shock mount system and steel mesh grille for rough use. They also feature low-frequency roll off, giving the user more control over the proximity effect. Along with these features, the SM58 and the Beta 58A are both fine-tuned for vocal performances and suited for use in the studio or on stage. The Shure KSM8 and the Shure Beta 58A share fewer similarities. However, they are both designed specifically for vocalists. The main difference is the quality. While the KSM8 is considerably more expensive compared to the Beta 58A, it delivers superior sound. If you want to get a reliable microphone that is trusted by both professionals and amateurs, the Shure Beta 58A deserves your consideration. It delivers a high signal compared to other microphones in the same price range and provides versatility. While the Beta 58A was designed for vocals, it gives you the natural sound needed for recording or amplifying speech. You can use it in the studio or on stage for public speaking, broadcasting, church services, or any other non-musical or musical application. 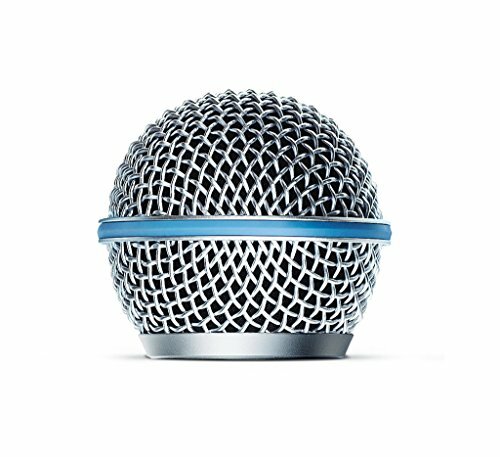 With hundreds of five-star reviews, most customers agree that the Shure Beta 58A is a dependable solution for road microphones, home studios, and churches.